We love Greece, our Mediterranean neighbor, a favorite island vacation destination from here. Any Greek island is a great escape from Israel, half an hour’s flight away, much of the cuisine is the same or similar, the people are laid back and the pace so slow. Very different from our stressed middle-eastern side of the same sea. I know Greece is getting a lot of bad press lately based on tourism ads directed to our European news channels, the tourism industry is still likely to do well. It should, Greece has it all, cuisine, nightlife, sports, spectacular scenery. To sum up how I feel about Santorini, well, its almost heaven on earth. Before having my blood pressure taken, I envision the view from our hotel balcony to lower the result, it works! Homeade wine is sold by the 1 1/2 litre plastic water bottle at the local hole-in-the-wall markets. Together with our wine discerning French guest neighbors we would take our purchase and sit and stare for hours at the islands, the caldera in the distance suspended in blue water and sky. None of us seemed to care about the quality of the wine, which wasnt too bad (buy the homeade white). We were once told by our favorite hotel owner, as he readied to take us late to the airport, “Don’t worry, this is Greece, the flights don’t leave on time.” I’m sure Athens is different but every island visit was the same, flights didnt leave on time. Pastitsio is a meat and pasta dish with a bechamel base that has several regional versions. I discovered the dish which underwent a trial and success evolution into my own recipe, which is more like the version from Crete than other islands. Its a great way to use ground beef in a casserole, preparation is a bit tedious and messy (I understand the origin of its name is part pasta and part Italian word for ‘scattered mess’) but I’ve gotten it down to a science. The result is the best baked one-dish that took 3 pots meal I’ve ever made, and a Greek classic. You will need a frying pan for the ground beef, a pot for boiling the pasta, a saucepan for the bechamel. Begin with olive oil in the pan for the ground beef, add minced garlic. add ground beef and fry until browned. Add cumin, cinammon, allspice, 1/2 tsp. of the nutmeg and the tomato paste. Stir completely and add 1/2 cup of water. Cook until thoroughly mixed, remove from heat and set aside. Salt and pepper to taste. Mixture should not be soupy. Begin preparing pasta. To make bechamel/cheese sauce, melt butter in saucepan, when melted whisk in flour to form paste. Slowly add milk, then add the other 1/2 tsp. of nutmeg, pepper. Cook over low heat until thickens, not pasty. Whisk in yogurt and add the kaskoval and 1/2 cup of goat or cheddar. Mix and set to side. Drain pasta when al dente. Mix drained pasta in with bechamel/cheese sauce. Take half the pasta mixture and place in bottom of oiled casserole dish. Next put ground beef in sauce on top of pasta layer. Top the beef layer with pasta, cover the top with remaining cup of cheese. 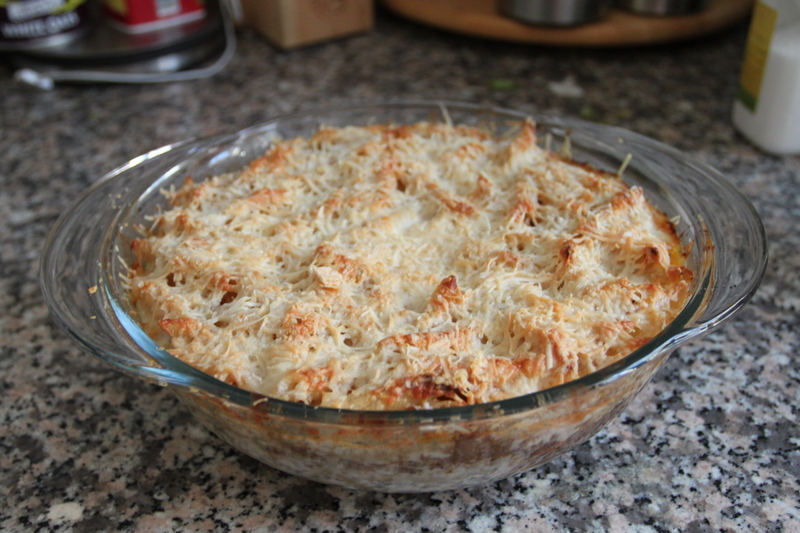 Bake in 365 F or 185c oven 30 minutes or until cheese crust is browned and layers below are bubbling. Serves 6. I tried reblogging from a wonderful food and photography blog I follow, and somehow in my inexperiece in such matters I screwed up, tried to reblog it again and couldn’t. The blog is Acorn in my Kitchen, post on Cecina, Rocket and strawberry salad. I asked the author about the featured ingredient, cecina, having never heard of it. He recommended bresaola, the Italian version which is available here and a first try for me. Since strawberries are not in season here I used figs. Excellent! 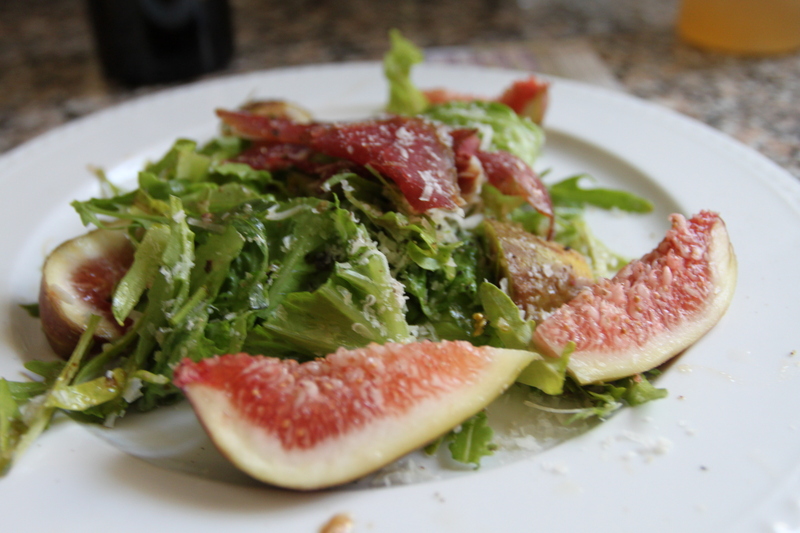 Place the greens as a base, with quartered or sliced figs surrounding, place bresaolo on top, sprinkle with grated parmesan. Drizzle olive oil and blasamic, top with ground pepper.